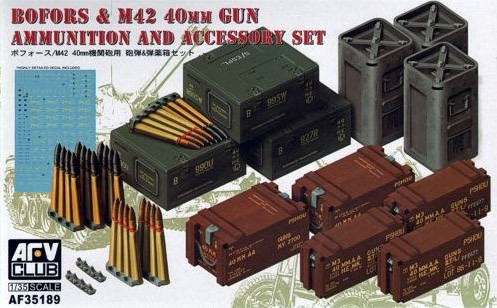 This set presents both U.S. and British containers for 40mm ammunition, which is great if you are building BOTH the U.S. and British versions of the Bofors gun (or M42 Duster). But it presents a lesser value if you are only building one, as only half of the four identical sprues will be of use. And while there is an abundance of ammo racked up on four-round charger clips, there are no individual rounds, nor the fiberboard containers that encased the rounds, and, alas, no spent shell casings. For those, you must resort to AFV Club's well done U.S. 40mm Gun Ammo Set Brass..
On the up side, AFV Club has done a fine job with what it gives us. The rounds scale out correctly and present suitable detailing. The large 24-round wooden boxes get the measurements right and include separate lids and rope handles. I could not find information on the smaller eight-round boxes, which do not have the rope handles. You also get an ample supply of empty charger clips. The decals are incredibly thin, so it's easy for them to fold over or wrinkle. It's best to get the carrier paper right next to the box surface and slide them directly to the box. You'll want to add the rope pieces (they also are very thin and fragile) after you apply the decals on the box sides. I used a bit of white glue to attach them in place. Make sure you gloss your painted boxes; I got some silvering from the decals that fortunately became much less apparent after I weathered the boxes. Keep in mind that, if you plan ahead, you don't need to decal sides of the boxes that won't be seen. As far as the British boxes go, I found photos of the larger one online and the kit matches it quite well. Unfortunately, AFV Club designed the smaller box so that seams of the two halves run through irregular sides, rather than along the corners where they would be easier to clean up. The British boxes also require many more decals than the U.S. counterparts and AFV Club provides them. Overall, this is a good item for arming your Bofors. If, like me, you find it less than complete, you can get the U.S. 40mm Ammo Set (AG35040) for four different types of separate rounds and a few spent casings. And perhaps find a pal to swap your unused boxes to build up your ammo dump. Check out the photos in my build article for the Bofors gun.